While you may be on the golf range pounding your little golf balls in all different directions, you may have lost the focus of what will make your golf game better. No matter how long you are on that range, it doesn’t dictate the level of your golf game. 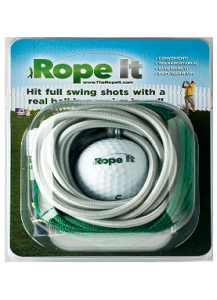 You must have the right tools and the Rope It golf training ball will help you to improve your game. And more importantly, you don’t have to use it on the golf range. You can stand right in your back yard and practice your golf swing. You might think that you have definitely got game, but sorry; you probably don’t until you get the right training balls. Most people don’t realize that the golf range has little to do with their actual golf swing. After many golf sessions practiced on the range, many golfers have not learned much. The same is true if you have had golf lessons. Your usable skills are not automatic until you get the feel of the Rope It golf training balls. Many elite and passionate golf athletes understand the importance of the golf training ball. Most of them take pride in choosing the right balls to drive up the golf course. The pressure of competing is too important not to have the right balls for the game and for training. It is time to tee off in your back yard, hitting that Rope It golf training ball without losing it across the street or in a pond. The golf training ball is very essential to the way the game is played and the success that golfers will have during competition. As it turns out, golfers are not the best people to assess their own skills when using the normal golf balls. However, with the Rope It golf training ball, there is a better understanding of what needs improvement as it relates to their golf swing. Most golf instructors are not much assistance either in determining a player’s golf swing. Without the proper training ball, there is no other way to estimate a player’s golf game. Moreover, when you entirely use the services of a golf instructor for help with your golf game, you are limited, but when you use the Rope It golf training ball, it is easier to measure your game and make improvements. Is the golf culture ready for this innovative way to practice golf? To find out the answer, take a look at the Rope it golf training ball today!